Al Mouj Muscat, Oman ... to feature 6,000 residential units by 2025. Communities at Majid Al Futtaim – Properties’ approach to placemaking is set to see the development of integrated communities in the region that are designed to drive both functional and emotional value for their residents and visitors. The company last year partnered with Neurons, a spin-off from the Copenhagen Business School and the Copenhagen University Hospital, to gain a deeper understanding of customers’ needs. And today, it is employing the findings of this study across all its communities in the Middle East and North Africa (Mena) region, including its new flagship Dubai community Tilal Al Ghaf, Hawazen Esber, CEO of Communities at Majid Al Futtaim – Properties, tells Gulf Construction. He says Majid Al Futtaim has continuously supported the economic growth of the Mena region by investing in people and developing mixed-use destinations that cater to the rising populations and evolving cities. Esber says what sets Communities at Majid Al Futtaim – Properties apart is its strategic direction to create integrated communities that are designed to drive both functional and emotional value for their residents and visitors, through its approach to placemaking. 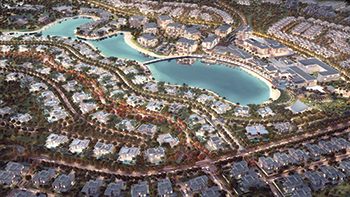 Its communities’ portfolio spans over 11 million sq m and includes the flagship community Tilal Al Ghaf; and a new mixed-use community in the largest urban development in Oman, Madinat Al Irfan, in addition to three live leading communities: Al Zahia in Sharjah, UAE, Al Mouj Muscat in Oman, and Waterfront City in Lebanon. Tilal Al Ghaf ... Majid Al Futtaim is employing the principles of placemaking to look beyond bricks and mortar, in a bid to offer balanced community living. Esber says Tilal Al Ghaf is being developed with the highest standards of urban design and planning principles in mind to offer community living crafted around people. Spanning 3 million sq m, the phased development will include more than 6,500 freehold homes when complete by 2027, ranging from apartments, townhouses and bungalows, through to substantial luxury villas. Around 355,000 sq m of landscaped open space will include green spaces and play areas, 18 km of walkable trails and 11 km of cycling paths. The first release in Tilal Al Ghaf includes ‘Serenity’ and ‘Harmony’ luxury villas and bungalows, with a wide choice of mid- to upper-luxury apartments and townhouses to follow. Off-plan bookings have begun, and the community’s Sales Pavilion and Show Villages are scheduled to be completed by Q4 2018, while the first homes will be occupied by Q3 2020. Sustainability is at the heart of Majid Al Futtaim Communities’ strategy to create healthy and balanced living environments, says Esber. “It’s not only us – there is already an increased focus region-wide on sustainability, particularly around building regulations and energy efficiency to address environmental challenges. “We believe it is important that developers incorporate key sustainability criteria into the conceptual and design stages of projects and think long term, to allow adaptability, which has been the approach for all our communities,” he says. “And so at Tilal Al Ghaf, we are setting new benchmarks for sustainable living by adopting a number of key measures to enhance our green footprint, such as extensive use of renewable energy, alongside smart technology to reduce energy consumption. “Active efforts will be made to promote recycling and composting, reducing the volume of the community’s waste going to landfill. Such measures will not only have environmental benefits, but in the long run will also deliver financial savings for residents on their utility bills and service charges. Tilal Al Ghaf is set to achieve the first Dubai-based community Breeam (BRE Environmental Assessment Method) accreditation with a ‘very good’ rating,” he adds. 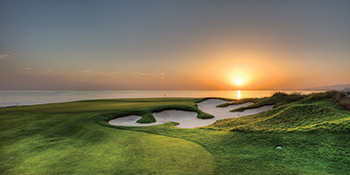 Meanwhile, in June 2018, Majid Al Futtaim entered a significant joint venture with Oman Tourism Development Company (Omran) to develop a new mixed-use community in the western area of Madinat Al Irfan, a catalyst for change in Oman. The community, set to become the urban centre of Muscat, spans over 4.5 million sq m and represents an estimated project investment value of RO5 billion ($13 billion) over a period of 20 years. Once complete, this mixed-use destination will be home to more than 50,000 residents, and will include over 11,000 residential units comprising villas, townhouses and apartments, 100,000 sq m of retail space, 700,000 sq m of office space, as well as several cultural and lifestyle offerings. Its other communities include Al Zahia, a bespoke masterplanned community under construction adjacent to the City Centre Al Zahia in Sharjah and due to open in 2020. The mall complements Al Zahia’s forward-thinking urban lifestyle, with emphasis placed on communal and recreational spaces that encourage human engagement and a healthy living environment for families. “Al Zahia continues to set new benchmarks for community living in the emirate with its high quality and contemporary mixed-use offerings. The community is currently home to 200 families living in the Al Jouri neighbourhood, and is expected to have more than 12,000 residents, when completed by 2024,” says Esber. This year more than 500 homes will be handed over in the Al Narjis neighbourhood, while the newest neighbourhood in the community, Uptown Al Zahia, was launched recently to redefine the urban scene with its residential, retail and entertainment offerings. In Oman, Al Mouj Muscat has firmly established itself as the leading mixed-use lifestyle destination in the sultanate. It is currently home to more than 2,000 families and will include 6,000 residential units, when completed by 2025. The community has elevated its integrated mixed-use offerings with the opening of two world-class hotels – Kempinski Hotel Muscat and Mysk by Shaza Al Mouj. Al Mouj Muscat has also recently launched Marsa Plaza, a 5,000-sq-m vibrant and diverse platform for performing artists, as well as a public space that draws people together, creating strong social bonds in the neighbourhood. Established in 2006, the communities business of Majid Al Futtaim aims to craft human-centric destinations by bridging people, businesses and cultures to create world-class communities. Currently, its portfolio represents about Dh80 billion ($22 billion) worth of investment. The division continuously collaborates with the various properties divisions, including shopping malls, hotels and project management, and other businesses, under the Majid Al Futtaim family of brands to develop a fully integrated community living experience that brings long-term value to its customers. Commenting on Dubai’s property market, Esber says Dubai has witnessed a surge in strategic investments and initiatives by the government to enhance infrastructure and drive economic diversification, even when many global markets have witnessed downward pressure because of oil prices. “We have witnessed a big push by the Dubai Land Department to further attract global investors – some of their initiatives include hosting editions of the Dubai Property Show internationally and organising more roadshows globally,” he says. Esber says Expo 2020 Dubai has resulted in a great number of opportunities for the real estate market. In the lead up to the Expo, there is a need for more affordable housing projects, which comes at a good time as the investment in infrastructure developments continues to pick up pace, he adds. He further says, as Dubai continues to strengthen its position as a global commercial hub and a leading tourism destination, there is a significant boost in the demand for quality destinations that offer value as well as immersive lifestyle experiences. “We believe that the greatest opportunities for developers in the emirate will continue to lie in this realm,” he concludes.